The lakhs of workers, peasants and agricultural workers who have gathered in the historic ‘Mazdoor Kisan Sangharsh Rally’ near Parliament in the national capital unanimously decided to strengthen the unity of these three class organisations and intensify joint actions against the anti people anti national neoliberal policies. 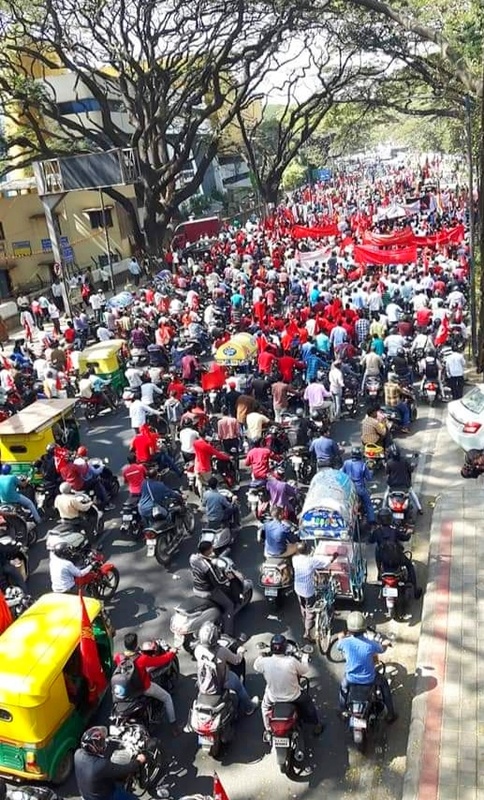 The Rally called upon the crores of workers, peasants and agricultural workers across the country to extend support and solidarity in all possible ways to each others’ independent struggles and build strong joint actions. Thus the workers will extend active support and solidarity to the joint kisan march on 28 -30 November, when thousands of peasants will walk around 100 km to converge in Delhi from various parts of the country. The peasants all over the country will stand in solidarity with the workers in their struggle programmes including country wide general strike which the Joint National Convention of Trade Unions will finalise on 28th September 2018. 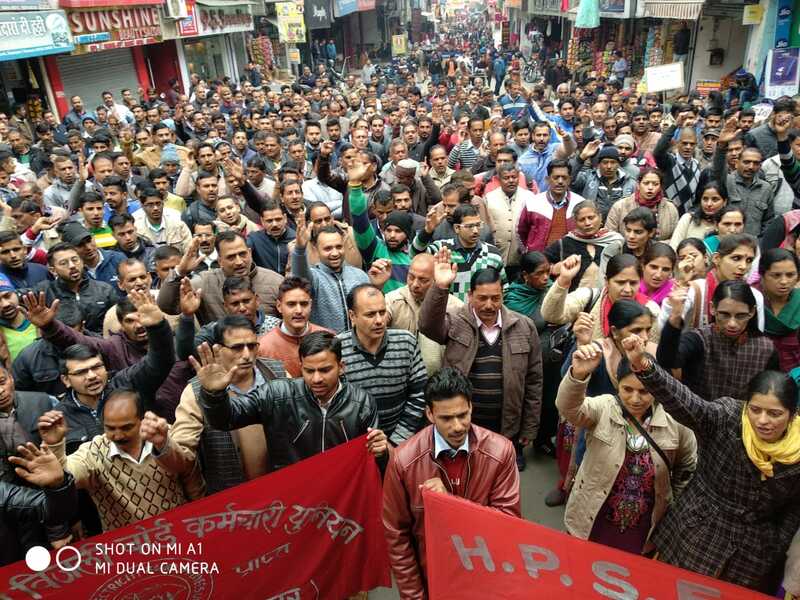 The ‘Workers Peasants Martyrdom Day’, which was being jointly observed for the last three years on 19th January, will be held in much more effective manner in 2019. The enthusiasm for joint actions of the three major sections of society who produce the wealth of the country was visible from Day One. 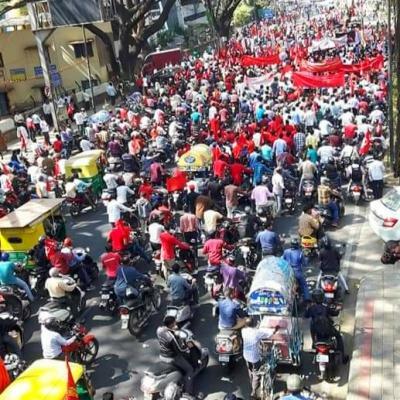 The announcement, in the CITU general council meeting in March 2018, that AIKS and AIAWU have agreed to join the massive rally planned by CITU was welcomed with thunderous applause. The participation of lakhs of workers in the ‘jail bharo’ programme called by AIKS on 9th August and the participation in several places of peasants in the night long ‘samuhik jagaran’ on the night of 14th August called by CITU, kept that enthusiasm alive. The floods that played havoc in Kerala and parts of Karnataka and later in Assam and other states in the north east, the incessant rains in many parts of the country could not dampen the spirit and determination of these lakhs of toiling people to jointly raise their voice against the policies that have been playing havoc with their lives. This is crisply stated by a tribal peasant from Chattisgarh - ‘Our problems are much bigger than this rain; that is why we have come’. The incessant rains in Delhi created huge difficulties for CITU which decided to organise a camp to receive the participants who were to reach national capital from 2nd September evening. Large parts of the maidan turned muddy with big puddles of water making only a third of the place available for erecting the tents. Emergency arrangements had to be made to lessen the hardship for the participants to the maximum extent possible. Despite all the efforts, no space could be provided to many more thousands who had to stay in the railway stations. But the participants understood the difficulties and cooperated in a highly disciplined manner. Not a single person complained. Instead, there was a festive mood in the camp, with songs, short plays etc and people from different states exchanging their experiences of struggles. It is not only the rains that created difficulties for the participants. 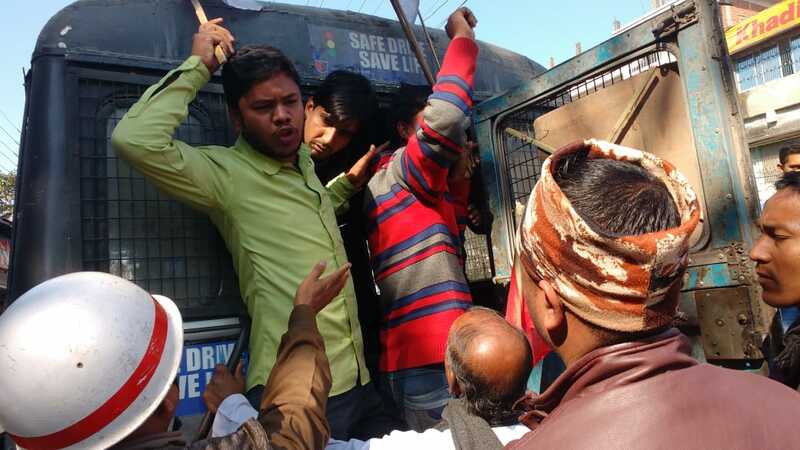 In several states the administration and the police tried different methods including threats and intimidation to prevent people from participating in the rally. 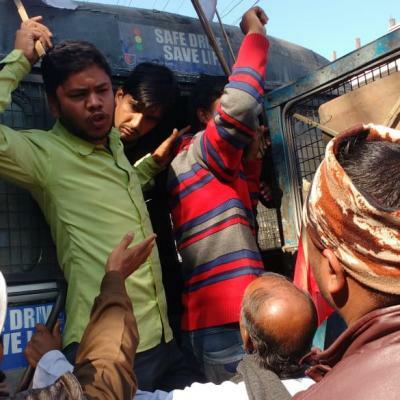 The police in the BJP ruled Manipur detained the leadership in a police station for two hours for issuing a press statement about sending workers and peasants from the state for the Mazdoor Kisan Sangharsh Rally. Fake and misleading reports were also widely circulated in the social media to prevent workers, particularly the scheme workers from participating in the rally. In several states the authorities threatened them of disciplinary action or arranged official meetings etc on the same day. The huge participation and the patience shown by the toiling people in facing all the hurdles to reach Delhi and participate in the Rally reflected their anger against their deteriorating conditions because of the policies of the government, which the ‘Mazdoor Kisan Sangharsh Rally’ has raised. 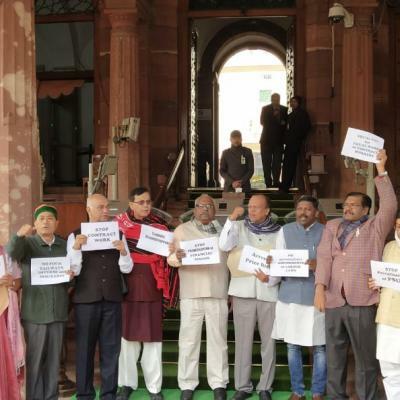 The lakhs of people who assembled near Parliament were determined to raise their voice against this. They were determined to fight for the reversal of the policies that were not only against their own personal interests but also against the interests of the nation as a whole. It was this determination that made them defy the adverse weather, defy the threats and intimidations of authorities and police and face the huge difficulties in travelling thousands of kilometres. 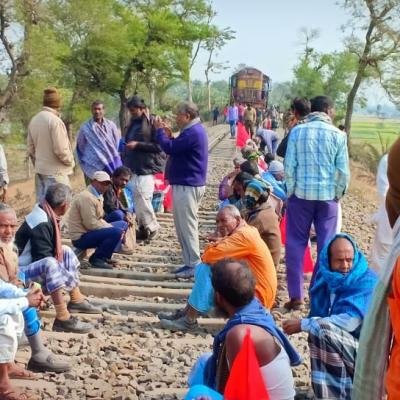 The thousands of anganwadi employees, ASHAs, midday meal workers, construction workers, MGNREGA workers, panchayat workers, village chowkidars etc travelled first from their villages to the nearest railway stations and then in jam packed railway compartments to reach Delhi spending 2-3 days one way. They brought their food and many marched carrying their luggage on their heads. 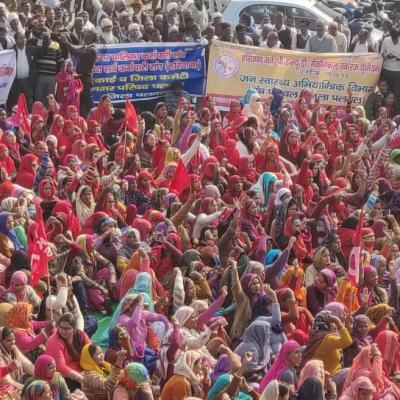 Significantly, women workers comprised over half of the total participants in the Rally. 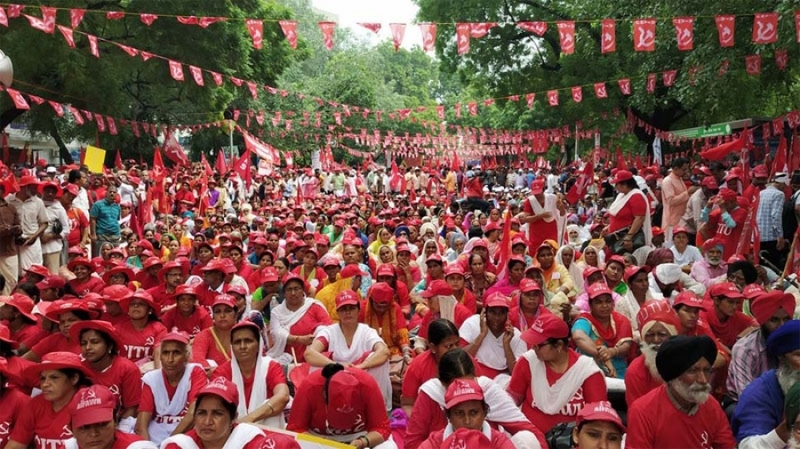 While scheme workers particularly anganwadi employees, ASHAs and midday meal workers comprised the largest contingent of women, women MGREGA workers, beedi workers etc also participated in large numbers. Another significant feature was the huge participation of industrial workers, from both public and private sectors. 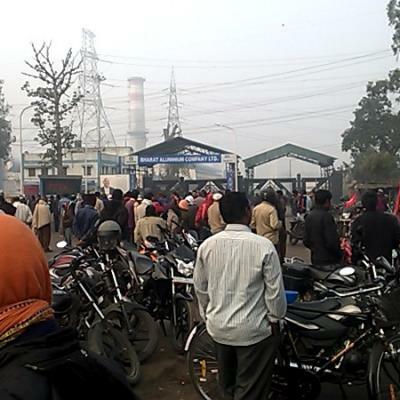 Road transport workers and electricity employees also participated in large numbers. State government and central government employees, BSNL, bank and insurance employees and school teachers participated in thousands. 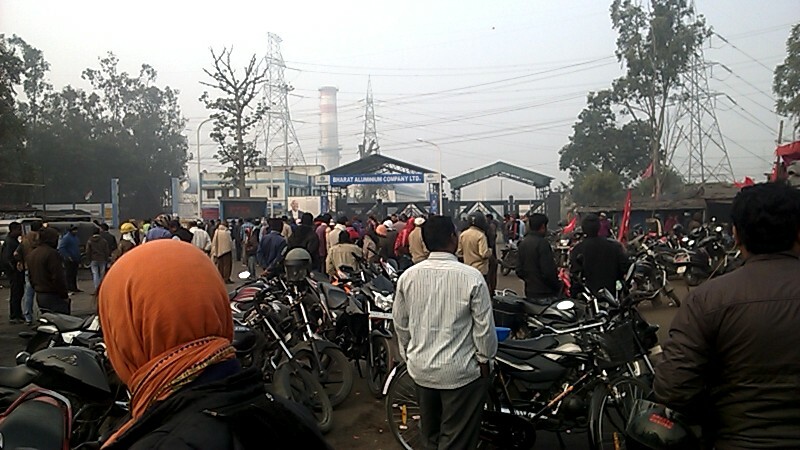 Despite the fact that the thousands who were on the back could not hear the speeches because the police did not allow mikes after a certain point, and also despite large numbers of them not understanding Hindi, the language of most of the speeches, most of the participants sat in the meeting till it was declared to be concluded. The chairman of the reception committee, Prabhat Patnaik, Tapan Sen, Hannan Mollah and Vijayaraghawan, general secretaries of CITU, AIKS and AIAWU along with other leaders of all the three organisations were on the dais. The presidium comprised Hemalata, Ashok Dhawale and S Thirunavakkarasu, presidents of CITU, AIKS and AIAWU respectively. Tapan Sen, Hannan Mollah and Vijayaraghawan were the main speakers from their respective organisations. They all strongly criticised the pro corporate policies of the government and vowed to intensify joint struggles to defeat these policies. 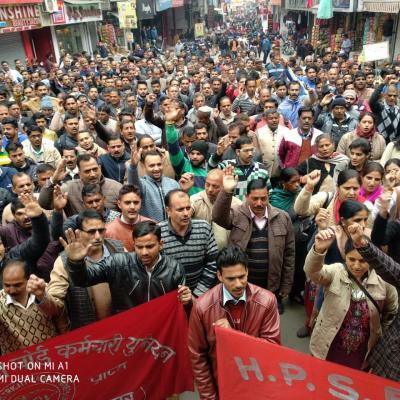 Defeat of the BJP led Modi government was necessary for intensification of this struggle. 30 leaders representing the fraternal trade union organisations and the affiliated federations of CITU, and AIKS and AIAWU spoke in the meeting. Amra Ram from AIKS, Brijlal Bharti from AIAWU and Tapan Sen from CITU made concluding remarks. Tapan Sen emphasised the need to take joint campaigns and struggles to the grass root level immediately after going back to their respective places. He said that while defeating Modi government was an immediate necessity that does not ensure reversal of anti people policies. 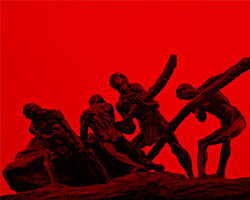 Sustained joint struggles of the workers and peasants were essential not only for the reversal of the neoliberal policies but also change in the capitalist system of which exploitation is an inherent part.